Hopes were high as the Clarets prepared for a Tuesday night trip to the Baseball Ground for an FA Cup replay against Derby County. We'd played so well against them in the original tie at Turf Moor ten days earlier, drawing 2-2, that many Burnley fans were ready for some giant killing. For the church goers in town there was some terrible news. St. Peter's Church should have been ready for a re-opening after the restoration work but this had been delayed by the fire during the autumn of 1991. More problems had been found and this had left church members with a further £64,000 to find to fund the necessary work. They were set to hit the town with collecting buckets as they looked at ways of raising the funds. Parents of children at Habergham High School were being asked to vote on whether the school should opt out and become a grant funded school. Those parents were advised to think carefully and vote with a resounding no by local MP Peter Pike. As those parents considered their vote there were certainly some very proud parents of the children at Accrington Road Nursery. Those young children had done the town proud and picked up a top award for their work in improving the nursery by washing graffiti from the walls, picking up litter and weeding the garden. The chaos in the town centre continued with more accidents and people getting confused and lost. One lady told the Burnley Express that she'd written to her councillor to ask him if he could provide a route from the Summit, where she lived, to Curzon Street. He couldn't and so the lady decided that the best course of action was to drive to Accrington, park for free, and do her shopping there. One of Burnley's best known and best loved landmarks had been sold. That's how the news of the sale of the Keirby Hotel was reported. I couldn't quite get my head round best loved but the hotel was about to have its third name. "The prestigious resting place had entertained many famous people such as Sir John and Lady Mills along with their daughter Hayley Mills for the opening of the film Whistle Down the Wind", said the report, although it failed to point out that it was over thirty years ago since the Mills family had been there and that was when the hotel was in its first year. From the Keirby it became the Crest and then back to the Keirby, but the latest sale meant it would be known as the Friendly Hotel. I wonder if it had the clean rooms that were so proudly advertised during 2011. Lucas Sports Ground at Reedley was under threat with it potentially being dug up for housing. Prime Minister John Major had been asked to help with residents up in arms at the potential loss of such an excellent sports ground. The council had also written to Labour leader Neil Kinnock, Sports Minister Robert Atkins, local MPs, the MCC and all groups that made use of the facilities. Meanwhile down at Turf Moor the directors of Burnley Football Club found their cars damaged by vandals. Three directors, Basil Dearing, Clive Holt and Bernard Rothwell were badly damaged whilst they were in a board meeting at Turf Moor. Dearing, whose Jaguar was damaged, said: "I chased one of them, and there was at least another youth with him." He added: "In the past there has been damage to club property when the team have been doing badly, but it seems strange at the moment when we are doing so well." We were playing well but we were somewhat fortunate to come home from Derby still in the FA Cup. We were thrown a lifeline as the weather intervened. Freezing fog settled on the ground with Derby 2-0 up, leaving referee Ken Redfearn with no alternative but to call it off. Manager Jimmy Mullen had kept the side beaten at Blackpool with the only change coming on the bench where Mark Yates replaced the cup tied Adrian Randall. Burnley played well for all but five minutes of the first half and gave Derby some worrying moments, but our opponents did look a different prospect than at Turf Moor and we were always fighting to stay in the game. Unfortunately, in that five minutes, goalkeeper Mark Kendall played a major part again. He'd had a nightmare at Blackpool in only his third Burnley appearance, and here he conceded a soft one. He seemed to save a shot from Phil GEE but the ball worked its way under his body and into the net. Five minutes later, he and Steve Davis both stood watching as Gee nipped in again. This time Joe Jakub came to the rescue and cleared off the line. 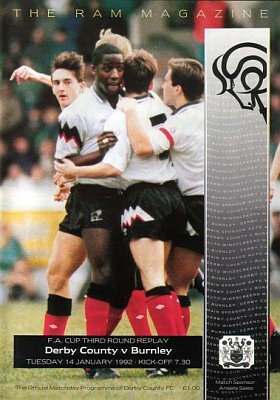 A scramble followed but it bobbled away to Derby full back Mark PATTERSON who hit a 25-yard screamer into the net. Two goals behind at the interval, any hope of a win had gone. 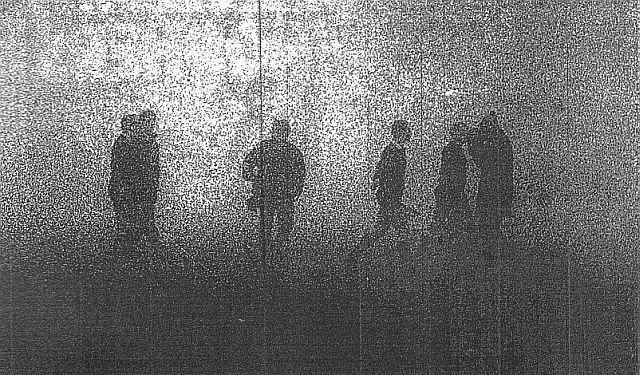 With the players off the pitch there was an announcement warning people to take care driving home as freezing fog was settling in the area. Latching on to this, the Burnley fans immediately started chanting: "We want fog, we want fog," but the teams came out and started the second half. Within two minutes of the restart, referee Redfearn felt the need to discuss the situation with his linesmen as the fog descended on the Baseball Ground, but the game continued and Burnley twice came close to pulling a goal back. Redfearn looked as if he'd made the right decision because the fog then lifted completely but around a quarter of an hour later it was back and worse than ever. As the game continued, Derby fans taunted Burnley fans with 3-0 chants. They hadn't scored but it was impossible to know from the end where the Burnley fans were situated. Eventually play was suspended for fifteen minutes but with two of those minutes remaining Mr Redfearn returned with his linesmen. He sent them to their respective sides and immediately called the game off. The referee said: "You have to remember that we are in the entertainment business and that a lot of people had a long way to drive home. I could have suspended play for longer and made people wait but if it had gone on to extra time and penalties we could have been here until midnight and most people have work to go to tomorrow." You couldn't wipe the smile off Jimmy Mullen's face. "Of course I am relieved that we have got a chance of having another go at them, playing Aston Villa in the next round is a big target to aim for," he said. It was confirmed that the second attempt at the replay would now be played on fourth round day whilst Mullen revealed that, following another desperately poor performance, goalkeeper Mark Kendall had left the club with immediate effect. The fog on the Derwent definitely came to our rescue that night.